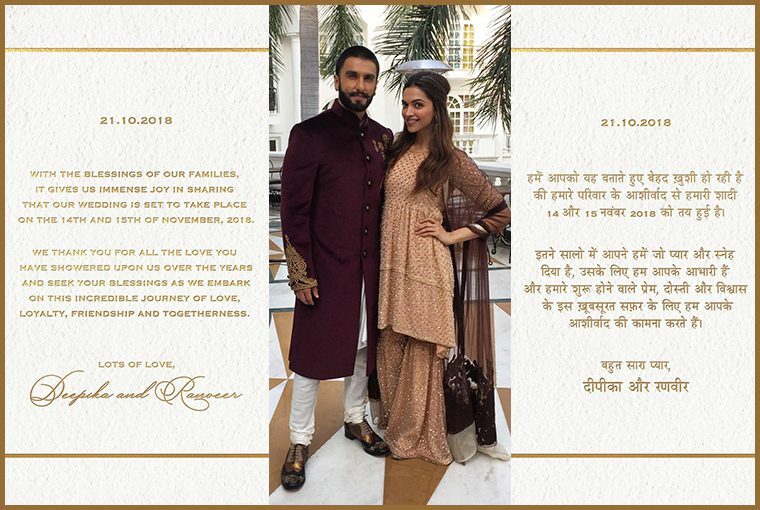 The announcement of Deepika and Ranveer’s wedding date announcement has intrigued everyone. The lovebirds will tie the knot on November 14 and 15, 2018. It’s just 20 days away and the announcement has made everyone curious about their wedding venue, attires, guest list, special performances several other details. There were already many rumors surrounding even before the couple made this statement official. As per some sources, the couple has planned to get married in Italy’s Lake Como. It is also being said that Sabyasachi Mukherjee will be designing the bride’s outfits. Speculations are also there that a Delhi-based wedding planner has been roped in for the wedding and sangeet will be on November 13. There will be two receptions hosted by the couple in India which will be held Mumbai and Bengaluru – respectively. Their subtle weddings announcement on Instagram really took everyone’s breath away. Their fans are waiting for their weddings since their relationship that started in 2013. They have scorched the silver screen with their sensational chemistry in Goliyon Ki Rasleela Ram Leela (2013), Bajirao Mastani (2015) and Padmaavat (2018). Let’s wait for their big day and see what speculations is true regarding their wedding! !